The Story: The Boogeyman (Jude Law) is tired of children not believing in him anymore, so he plans an attack on Earth to steal the innocence of every child and make the world a dark place. Santa Clause (Alec Baldwin), the Tooth Fairy (Isla Fisher), the Easter Bunny (Hugh Jackman) and the Sandman – who are protecting the innocence of children – need Jack Frost’s help. But Jack has lost hope in himself and needs to find out where he actually comes from. The time is ticking, because if the children stop believing, the Guardians will diasppear forever. Review: What a wonderful family movie. I love how Santa Clause is Russian and the Easter Bunny Australian, it is hilarious. The characters have so much depth and the voices fit perefectly. The story is simple yet very effective and there is no thin air at all. The Sandman was definitely one of my favorite characters, even though he didn’t say a word during the whole movie. 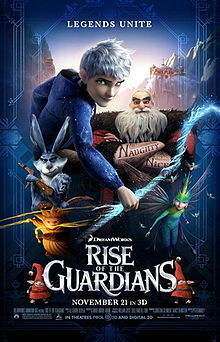 Rise of The Guardians is the perfect movie for the holidays, I will probably watch it during Christmas season again. Good Idea! 😀 Do you have any Indian cartoons that deal with Indian fantasy characters? Write a letter,fax or ,email to a movie company and suggest it! Pingback: Monsters University (2013) – A winner! | Simon Says... WATCH THIS!